He has been doing therapy work in his retirement to include nursing homes, hospitals (including the psychiatric ward in which only very mild, sound dogs can go), emergency rooms and daycares for mentally challenged adults. He has been at the bedside of those dying and has assisted families of those patients. While he is an awesome at his work he also still loves to play and romp. He loves tennis balls, squeaky toys and lying in his pool on hot summer days. 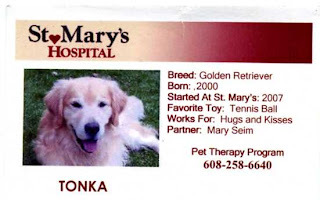 Tonka dabbles in agility and is always a hit at the agility shows we put on at the nursing homes. The sound of human voices makes his tail wag like no other. He is an awesome dog and we are very fortunate to have him in our family. He is in good health and enjoys his chiropractic visits for his aging bones. He currently shares his home with 2 Golden Retrievers -Harvestime’s Mischevious Molly (12 yrs), Harvestime’s What’s One More Sadie (10 yrs), a Cocker Spaniel and a Cavalier King Charles Spaniel."